Have you heard of gribiche? It’s an eggy French vinaigrette, apparently friends with mayonnaise, that is made from hardboiled eggs, oil, vinegar, capers, and fresh herbs. It’s divine! This lunch came together in about 45 minutes, about the time it took to fully roast the potatoes. That may seem a bit long for lunch…but I felt quite leisurely while I was working on it, and I definitely commend the result! Maybe you have been around me long enough to know that I hold a bit of a grudge against potatoes. Potatoes belong in the mental carb category, not the mental vegetable category! 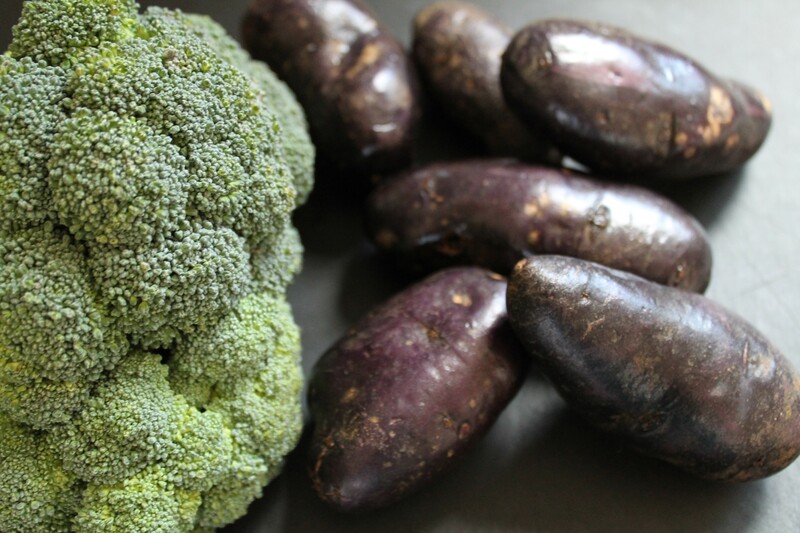 But I think these purple potatoes are a good bridge between the two, because they are full of antioxidants not found in a typical white potato (a special bonus for a fruit-hater like me)! They are kind of like the superheroes of the potato world, with the same delicious flavor as any regular potato but a more powerful nutritional punch! I am so happy that my grocery store has started stocking them regularly. I feel much better about serving potatoes when they are purple. Typically, the purple potatoes I find in the store are about the size of a golf ball, but this time they were giant monsters! I cut them up into bite-size chunks. 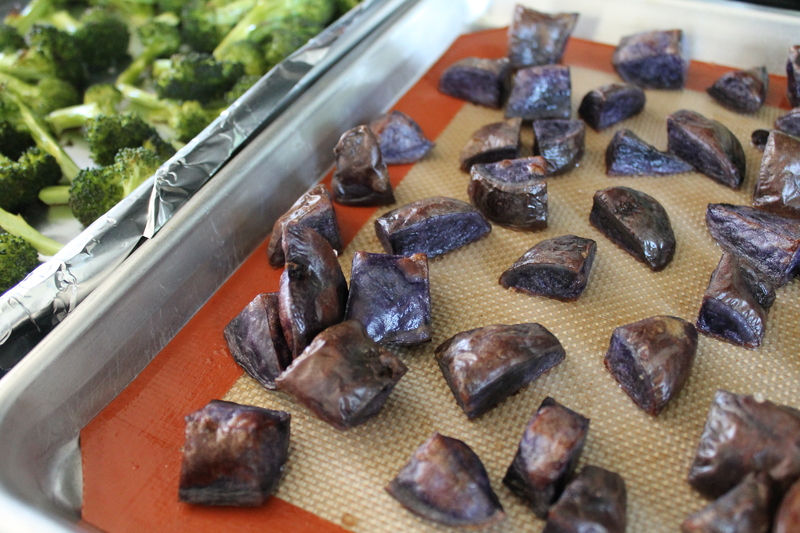 If you can’t find purple potatoes, I recommend buying new red potatoes or fingerlings so you won’t have as much chopping to do. Toss the potatoes in a little olive oil and salt and roast on a cookie sheet in a single layer, ideally not touching each other at all, for 20 minutes at 400°. Meanwhile, hardboil your eggs and cut the broccoli into florets. I left quite a bit of the stems attached, partly because the stems are sweet and delicious, and partly because I was a little short on broccoli and wanted to maximize what I had. However you choose to chop your broccoli, just make sure the pieces are small enough to fit easily into your mouth! 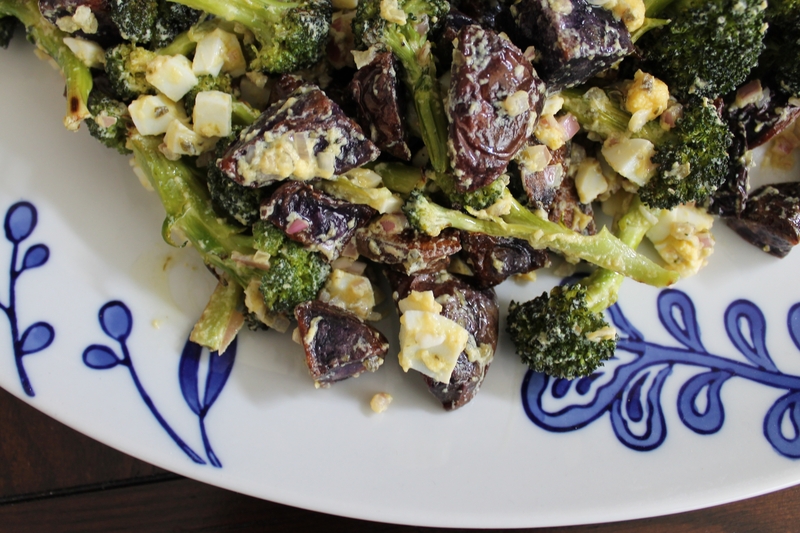 Toss the broccoli with olive oil and salt and spread on a cookie sheet. 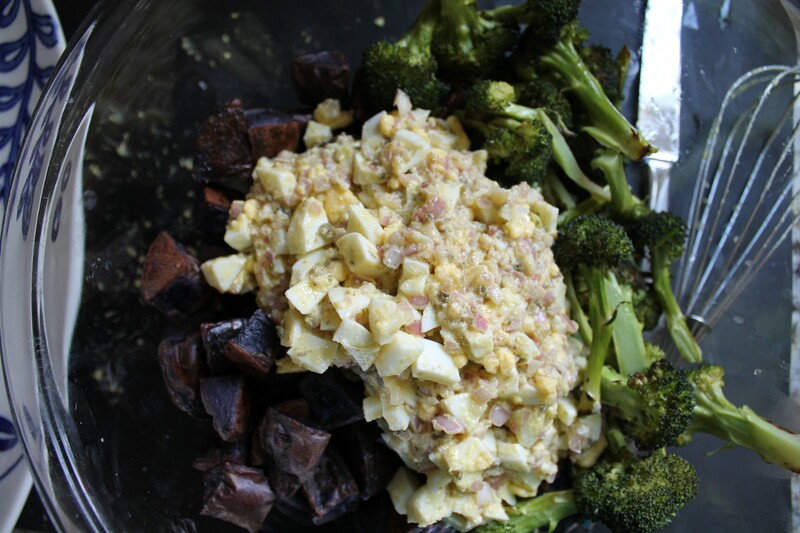 After the potatoes have roasted for 20 minutes, slide the broccoli into the oven together with the potatoes. I actually turn my oven to the convection setting when I have two pans stacked on different oven racks. If you don’t have a convection oven, then you may need to roast your veggies a little while longer to get them tender in the center and crisp on the outsides. I roasted another 20 minutes (without convection, if your trays are not side by side, you may need an extra 5–10 minutes). While the veggies roast, prepare the dressing! Mince 1 large or 2 smaller shallots. You should end up with about ½ cup minced shallot. Also, drain some capers and chop them finely. Set them aside with the shallots. In a medium bowl, mash up one of the hardboiled egg yolks as finely as possible. I kind of would have liked to use a mini food processor, but that seemed like it would be taking the ease out of doing dishes later, so I used my fork. The better you mash the egg yolk, the smoother the dressing will be. Whisk the yolk with olive oil, streaming it into the bowl slowly and whisking furiously to try to create a smooth emulsion. Mine wasn’t super thick, and there were a few bigger pieces of yolk in there, but the end result was still delicious! Stir in the vinegar, Dijon, chopped shallots, capers, and salt. 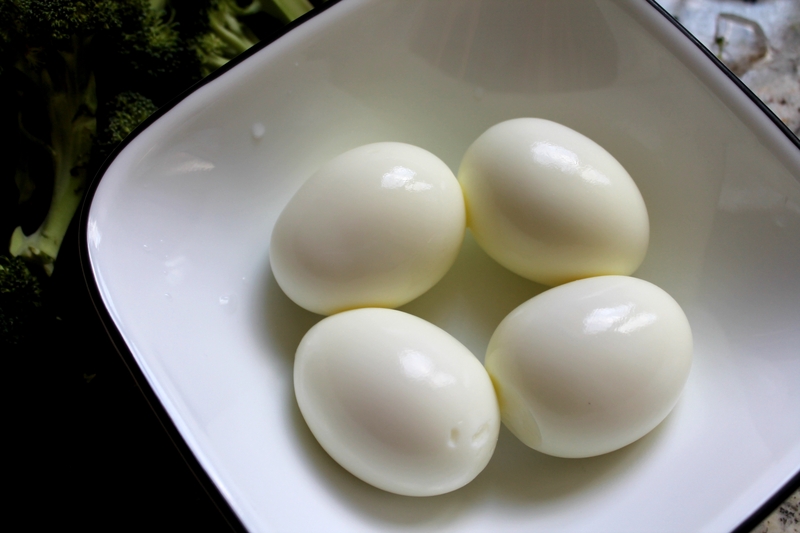 Go dice up the rest of the hardboiled eggs, including the white you already set aside, and toss the eggs into the dressing. Stir to combine. Yum. Um, here’s where I was supposed to add tarragon, parsley, and chives to the gribiche, and where I instead added nothing. Not on purpose…I had one of those “Oh no!” moments about 2 minutes after putting the last of the lunch dishes into the dishwasher. Moral of the story: minced herbs are traditional in this dressing, but the sauce is just as delicious without them! Use whatever herbs you like, or skip it entirely if you are trying to save a buck or 5 minutes. In a large bowl, toss the gribiche with the roasted potatoes and broccoli. My broccoli had little charred edges and the potatoes blistered beautifully! Serve immediately. Act nonchalant. Yeah, I just whipped up a little something for lunch…no big. ½ cup olive oil, plus 2 tbsp. Toss the potatoes with 1 tbsp. olive oil and a sprinkle of salt. Arrange on a lined cookie sheet so that none of the pieces are touching each other. Roast until they are cooked through, about 35–40 minutes. Meanwhile, hardboil the eggs and peel them. The yolks should be completely pale yellow in the centers and not gray on the outside, otherwise the gribiche sauce will not come together well. 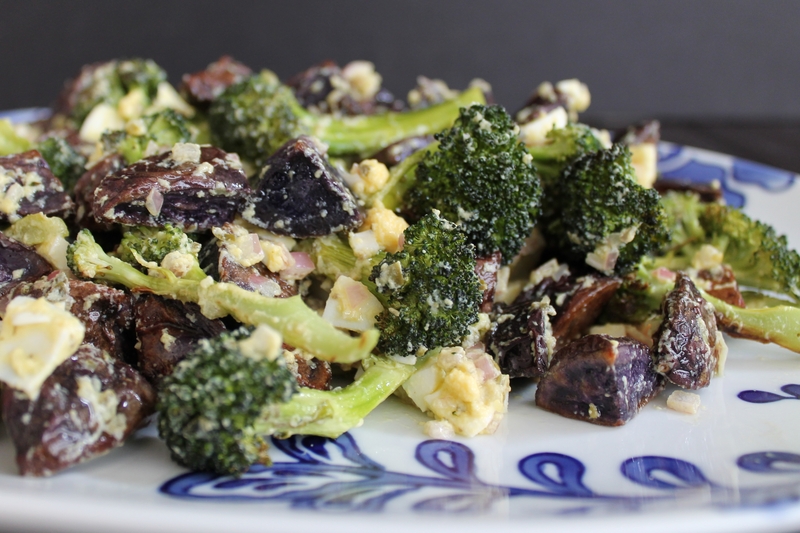 When the potatoes have about 15 minutes left in the oven, toss the broccoli with 1 tbsp. olive oil and a pinch of salt. Spread in a single layer on a lined cookie sheet and place in the oven on the lower rack. Roast the broccoli with the potatoes until the broccoli is brown at the edges and the potatoes are crisp outside and tender all the way through. Meanwhile, make the gribiche. In a medium bowl, mash 1 of the hardboiled yolks to as fine a powder as possible. While whisking constantly, slowly stream in the remaining ½ cup olive oil, until the liquid is glossy and smooth. 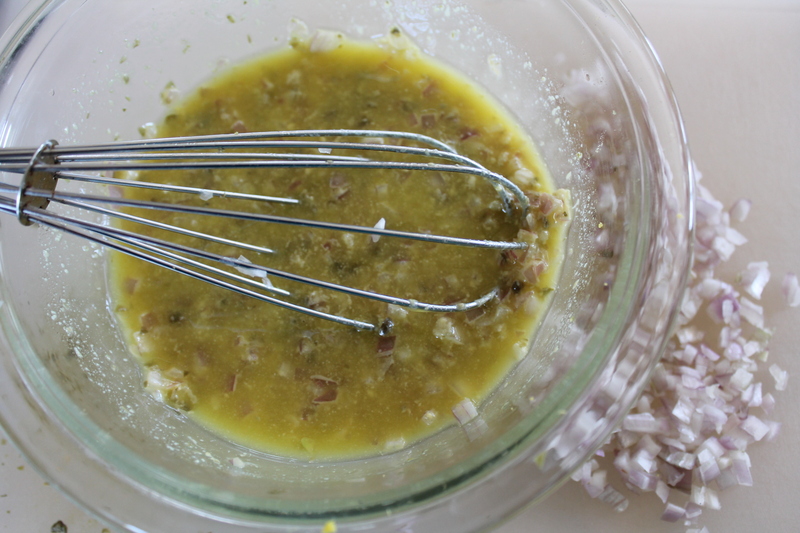 Stir in the vinegar and mustard, followed by the capers, shallots, and ¼ tsp. salt. Add the fresh herbs, if using. Remove the potatoes and broccoli from the oven. Toss with the gribiche in a very large bowl. I am so obsessed with this.